Will Smith does not have any MLB stats for the season. 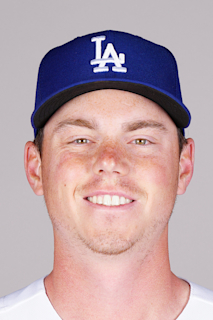 February 11, 2019 Los Angeles Dodgers invited non-roster C Will Smith to spring training. August 1, 2018 C Will Smith assigned to Oklahoma City Dodgers from Tulsa Drillers. June 3, 2018 Tulsa Drillers activated C Will Smith from the 7-day disabled list. May 8, 2018 Tulsa Drillers placed C Will Smith on the 7-day disabled list. January 30, 2018 Los Angeles Dodgers invited non-roster C Will Smith to spring training. September 20, 2017 Tulsa Drillers activated C Will Smith from the 7-day disabled list. July 14, 2017 Tulsa Drillers placed C Will Smith on the 7-day disabled list. July 13, 2017 Tulsa Drillers activated C Will Smith. July 9, 2017 C Will Smith assigned to Tulsa Drillers from Rancho Cucamonga Quakes. March 12, 2017 C Will Smith assigned to Los Angeles Dodgers. August 1, 2016 C Will Smith assigned to Rancho Cucamonga Quakes from Great Lakes Loons. July 2, 2016 C Will Smith assigned to Great Lakes Loons from Ogden Raptors. June 22, 2016 C Will Smith assigned to Ogden Raptors. June 21, 2016 Los Angeles Dodgers signed C Will Smith.